Diplomacy has been one of the key thrust areas of the government as their diplomatic outreach has traveled a long way in the last four years. Sunday, May 27, marks the fourth anniversary of the Prime Minister Narendra Modi-led BJP government at the Centre. It was a challenging four-year tenure for the PM, with controversies surrounding the Rafale deal, tumultuous ties with China and Pakistan, tensions in Jammu and Kashmir, demonetisation and GST, and farmer distress among a few issues. Diplomacy has been one of the key thrust areas of the government as their diplomatic outreach has come a long way in the last four years. Although the government witnessed several ups and downs in its relationship with different countries, it had to adapt to the changes. While the Congress-led Opposition has criticised the prime minister of keeping silent on critical issues, Modi did not make things easier by holding no interactions with the press during the entirety of his tenure. On Saturday, one day prior to completing four years, congratulations and reactions from political leaders have started coming in. Senior Congress leader Kapil Sibal today hit back at Prime Minister Narendra Modi for his 'naamdar' (dynast) barb,saying the people of the country want the next prime minister to be 'kaamdar', 'jimmedar' and 'imandar' who is not in the habit of making hollow promises. "People of the country want the next prime minister to be not only 'kaamdar' (one who works) but also 'jimmedar' (responsible) and 'imandar' (honest) who is not a 'jumlawar' (one who makes hollow promises)," Sibal said in Bhubaneswar. Senior Congress leader Kapil Sibal today hit back at Prime Minister Narendra Modi for his 'naamdar' (dynast) barb and said the people of the country want the next prime minister to be 'kaamdar', 'jimmedar' and 'imandar' who is not in the habit of making hollow promises. "People of the country want the next prime minister to be not only 'kaamdar' (one who works) but also 'jimmedar' (responsible) and 'imandar' (honest) who is not a 'jumlawar' (one who makes hollow promises)," Sibal said in Bhubaneswar, Odisha. Prime Minister Narendra Modi ends his address in Cuttack, Odisha. "Due to the Mahanadi water dispute, farmers of Odisha are suffering. We are committed to resolve their problems and address the challenges they have to face," says PM Modi. Today, the country is progressing rapidly. We have built crores of homes, modernising hospitals, introduced Digital India. all these are creating job opportunities for the youngsters. We are keeping special attention on youngsters. We are building longest tunnel between in Leh. We are increasing the connectivity of the northeastern states with that of other parts of the country, says PM Modi. "It was my dream that people wearing 'hawai chappals' (slippers) should also travel in 'hawai jahaz' (airplanes)," says PM Modi. And today, we can see that number of people travelling in airplanes is higher than those by trains, he adds. "We have introduced better transport communication, better education system, better infrastructure facilities. We have changed the street lights to LED lights which resulted in saving crores of rupees. We used that money now for other social purposes," says Modi in Cuttack. PM highlights various schemes of his government during the address, says cach citizen will get the benefit of health scheme. The NDA government is on correct path; people have put their seal of approval, says PM Modi. "Over 18,000 homes have electricity. Within next year there will be fully connectivity between the village and cities. There will be well road connectivity. From 1947 to 2014, there were six crore toilets. but last fours, there was newly built around more than seven crores toilets," says PM Modi. "NDA government is working towards the benefit of common people. I can assert that my government is working with the people’s mandate, not from any Janpath," PM Modi insists. "If Congress and its family understood that, then the country would never have been in the state it was in before 2014. Give the poor just slogans of "gareebi hatao", give broken roads and hospitals to the middle class - that is all that the Congress did. Half the people did not have gas connections, electricity, half the villages did not have roads, toilets. Everything was incomplete. Vote bank politics was the reason behind this. And when we talk about vote bank politics, some people call it communalism," says PM Modi. "Who can forget the scams worth lakhs of crores that embarrassed India abroad? During UPA regime, the Congress party used to run the government through remote control," says PM Modi." It is important to remember the issues which the nation was facing four years ago, the atmosphere there was four years ago. It is important to remember how much did the family, which ruled the nation for 48 years, cared for it," he adds. Today, around four former chief ministers are in jail. This has forced all the oppositions to come under one umbrella. One family has ruled around 48 years in the country. The party believes -Family first instead of country first. "Today the BJP has over 1500 legislators in the country. These victories are not wins for any leader, this is the victory of the people. This is the win for those mothers who have been freed from smoking chulhas. This is the win of those girls who have been helped by Beti Bachao, Beti Padhao. This is the win of the youth helped by Skill India and Mudra Yojana. This is the win of the farmers who are guaranteed 1.5 times of the cost of produce," says PM Modi. Your aspirations, dreams and hopes is what makes me keep working, says PM Modi. "Many who are in the NDA government have lived in poverty and that is why betterment of the poor is their biggest priority. It is a government whose President, Vice President and Pradhan Sevak, all have lived in poverty," says PM Modi. "During the last four years, my government created a confidence among 125 crore Indians that things can change, India can change," says PM Modi. "It is my good fortune that I got the opportunity to greet my 125 crore countrymen from the land of great Lord Jagannath. Great freedom fighter Netaji Subhash Chandra Bose was born in this holy land," ANI quotes PM Modi as saying. PM Modi addresses a public rally in Odisha’s Cuttack on four years of his government. Addressing a press conference in Jaipur, Congress leader Sachin Pilot earlier in the day slammed Rajasthan's Vasundhara Raje government, saying it faces allegations of corruption. He claimed that 150 farmers have committed suicide in Rajasthan but neither the chief minister nor her ministers are concerned. "The government has money to spend on installing fountains in the front of bungalows of ministers and on events like Resurgent Rajasthan but not for farmers," Pilot said. Why has the BJP failed to address runaway rural distress ? "Nobody is safe in India under BJP govt, everyone is having sleepless nights," alleges Congress leader Ghulam Nabi Azad while addressing a press conference. Meanwhile, AICC General Secretary Ashok Gehlot says that an atmosphere of fear, hatred and violence has been created in the last four years under Modi regime. "People now know that Narendra Modi-Amit Shah duo is harmful for the country," PTI quotes Congress spokesperson Randeep Surjewala as saying. "Modi government's four years can be defined in four words - treachery, trickery, revenge and lies," he adds. 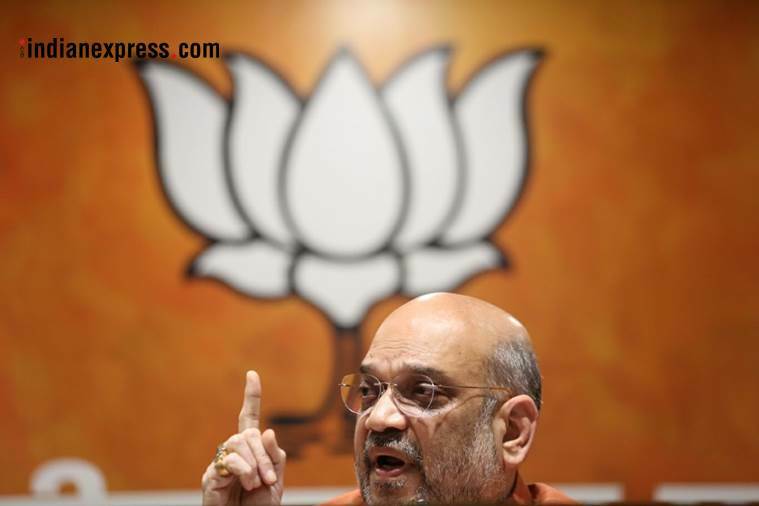 Amit Shah, during a press conference, said that with the 2016 surgical strikes conducted across the LoC, the government exhibited its political willingness to take on the country's adversaries. During the presser, the BJP president also listed the achievements of the NDA government on its fourth anniversary. Prime Minister Narendra Modi, on his government completing four years, listed some of its achievements, saying that over the last four years, development had become a "vibrant mass movement". "Over the last four years, development has become a vibrant mass movement, with every citizen feeling involved in India's growth trajectory. 125 crore Indians are taking India to great heights," he said on twitter, adding, "I bow to my fellow citizens for their unwavering faith in our Government. This support and affection is the biggest source of motivation and strength for the entire Government. We will continue to serve the people of India with the same vigour and dedication." I bow to my fellow citizens for their unwavering faith in our Government. This support and affection is the biggest source of motivation and strength for the entire Government. We will continue to serve the people of India with the same vigour and dedication. PM Modi has ended the politics of appeasement and dynasty, and ushered in politics of development, Shah said. 'Prime Minister Narendra Modi has ended politics of appeasement, dynasty and casteism, and ushered politics of development,' he said according to PTI. 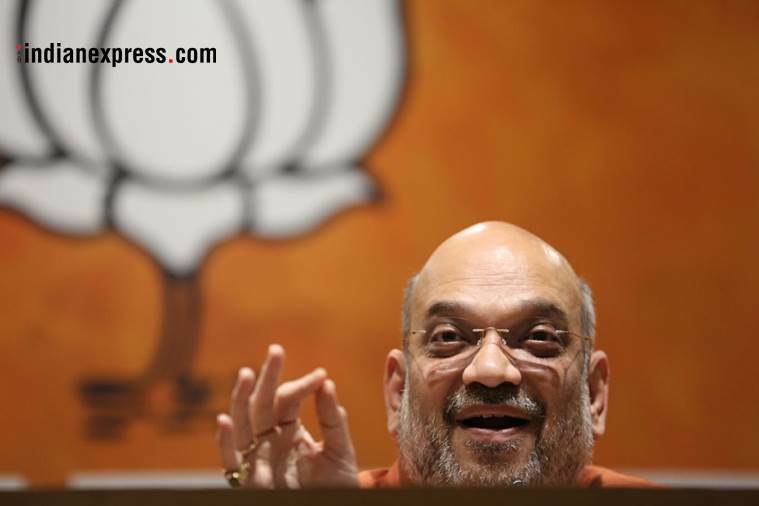 Reacting to Rahul Gandhi's scorecard, Amit Shah said, 'What else do you expect from Rahul Gandhi? He is in the opposition, he has to do this. Wo thodi na hamare bakhan karenge. We have presented facts and figures and anyone can challenge that.